As California’s enormous wildfires continue to set records for the second year in a row, state lawmakers are scrambling to close gaps in California law that could help curb future fires or make the difference between life and death once a blaze breaks out. A special joint legislative committee is examining how to shore up emergency alert systems so people know to evacuate and how to prevent fires through better forest management. Historically, said state Sen. Hannah-Beth Jackson during a recent interview in her Capitol office, "We have looked at fire as an enemy." That was a mistake, said Jackson, a Democrat. She represents Santa Barbara and Ventura counties, which were devastated by the massive Thomas Fire last December, and is pushing legislation that would expand prescribed burns and other forest management practices on both public and private lands. "We have been doing less and less to try to clear vegetation, to do controlled burns so that we can reduce the dead vegetation that we have," she said. "And as a result, we have conditions that are seeing fruition with these enormous and out of control fires." Jackson says after years of inaction, everyone in California is finally at the table — including environmental groups — supporting the measure and engaging in a conversation around forest management. Gov. Jerry Brown's administration has already steered $800 million into projects aimed at preventing fires in recent years. Jackson also has a bill that would let counties automatically enroll residents in emergency notification systems. It’s one of two bills aimed at shoring up gaps around evacuation alerts that were exposed by last years’ deadly fires. The other is Senate Bill 833 by North Bay Senator Mike McGuire. It would seek to expand use of the federally regulated, wireless emergency alert system in California. Technology has changed and governments must adjust, Jackson said. "We used to be warned about danger with the church bells, and then during the Cold War with Russia, we had a CONELRAD alert system. ... We don't have any of those things today," she said. "We rely upon people's cell phones. ... Fewer and fewer people actually have landlines today. So we've got to adapt and that’s what this program will hopefully do." At the national level, there’s also political maneuvering over fires. Department of Homeland Security Secretary Kirstjen Nielsen visited a fire zone in Northern California earlier this month and promised to start providing federal emergency funding earlier. And California U.S. Senator Kamala Harris spoke about her push to expand federal funding for both fighting and preventing wildfires during a recent tour of a fire area. Some of that money has already been included in a budget bill; additional funding is in a bipartisan bill that is cosponsored by senators from 10 other states, many of them in the fire-prone West. "Let's also invest resources in things like deforestation, in getting rid of these dead trees and doing the other kind of work that is necessary to mitigate the harm that that is caused by these fires," Harris said while visiting Lake County last week. Dollars are important: The state has blown through its firefighting budget seven of the last 10 years, even as the annual budget has grown five-fold over the same period. 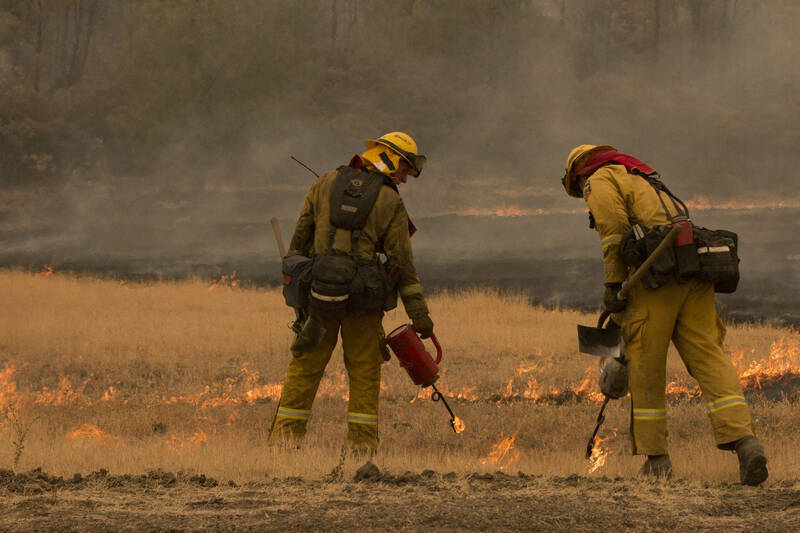 This fiscal year started six weeks ago, and California has already spent three-quarters of its firefighting budget for the entire year, according to the state Department of Finance. That spending is "a very stark indication of the severity and the scope of these type of catastrophic wildfires," Department of Finance spokesman H.D. Palmer said.